Customers are online right now talking about your products and services, and when you become part of this conversation you can realize the actual quantifiable return for investing in community comments. There is great value in listening to, and understanding your customer community. 1. Positive impact on development. Utilizing feedback, such as, expressed problems or issues, voiced ideas for improvements, suggestions for additions or expansions to your product, directly enriches the product and service development process. You can create an improved roadmap for the design, improvement or launch of products and services..
2. Reduce overall operating costs. Feedback from your community of customers is a source of information regarding issues, ideas and suggestions related to your product and services. By sourcing valuable insight at this level, you can reduce market research costs incurred by the use of surveys, focus groups and other forms of data collection. 4. Increased return on investment (ROI). Community comments can have a real and measurable impact on your organization’s ROI. You can reduce production time by implementing customer suggestions for process design and delivery, decrease costs by reducing product reiterations and deliver products that better meet customer needs. Customer satisfaction increases loyalty and decreases defection to the competition. 5. Establish a competitive edge. By paying attention to community comments about your competitors you can take action that will put you ahead. You can be alerted to competitor weaknesses so that you leverage your strengths. You can identify and respond quickly to market trends and shifts and leave your competitors behind. 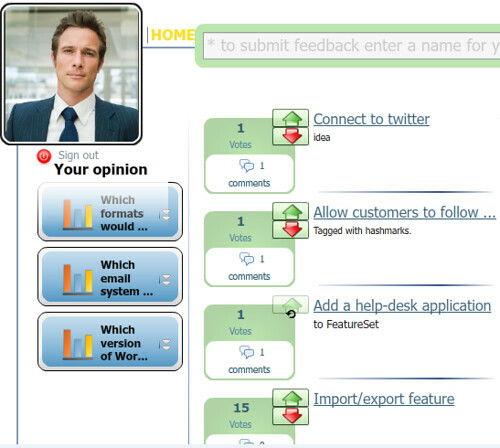 OneDesk efficiently collects community comments and other contributions for product ideas, such as, suggestions, issues and questions. Submitted through the customer portal, community comments flow directly to the people in your organization who are positioned to manage and harvest these valuable insights. Community members can post product suggestions, vote or comment on submissions from other members. OneDesk uses a discussion forum to gather product and service ideas from their customer base. The top ideas are posted for review, voting and comments. You can create a loyal customer base by listening, engaging and acting on community comments. Let OneDesk’s suite of social collaboration and product management applications help you build and deliver products that are more in-line with customer requirements, and watch your business soar to new heights. Ready to get started? Sign up for a free account today.